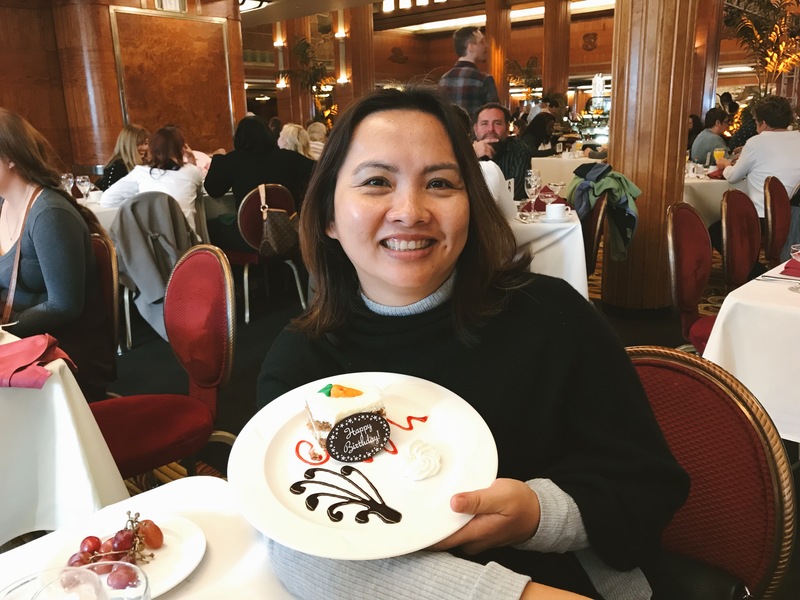 For my mom’s 46th birthday last December, she decided to go the same route my dad did and celebrated her birthday at the Queen Mary Sunday Brunch Buffet. She also opted to spend her birthday there because my aunt had wanted to check it out before heading home for Canada. 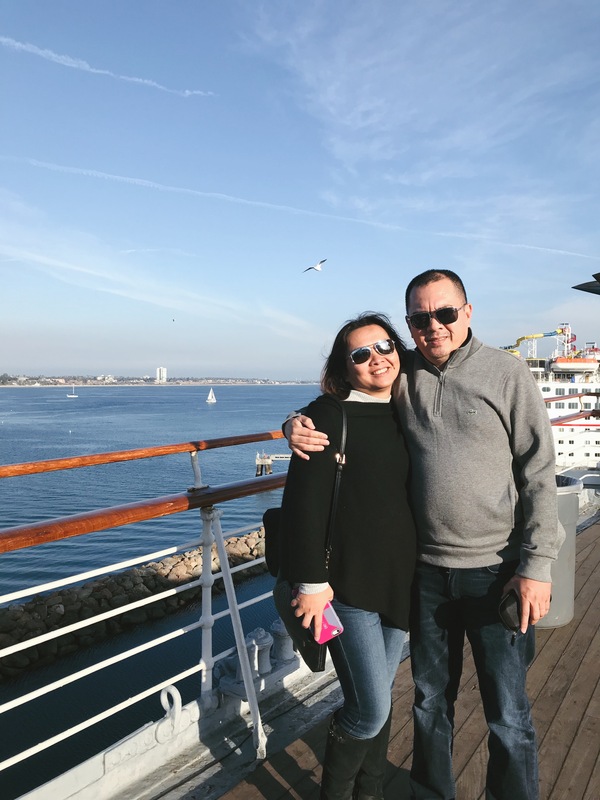 My mom’s birthday fell on a Saturday, and since the brunch is only on Sundays, we ended up celebrating on New Year’s Eve – the ship was packed with visitors in town for the Rose Parade & Bowl, as well as guests checking in for their NYE party. With that, the buffet was super packed! However, we were seated immediately. Whenever we have brunch here, I almost always just hit up the carving station because they always cook the prime rib the best way. Medium rare is the way to go, y’all. Plus, I’m obsessed with their dessert bar where you can grab some wafer sticks and top it with some whipped cream. Since it was New Year’s Eve, they had extra food stations and more breakfast options. After eating, we explored a bit of the ship. However, they had a lot of areas blocked off as they were preparing it for the night. 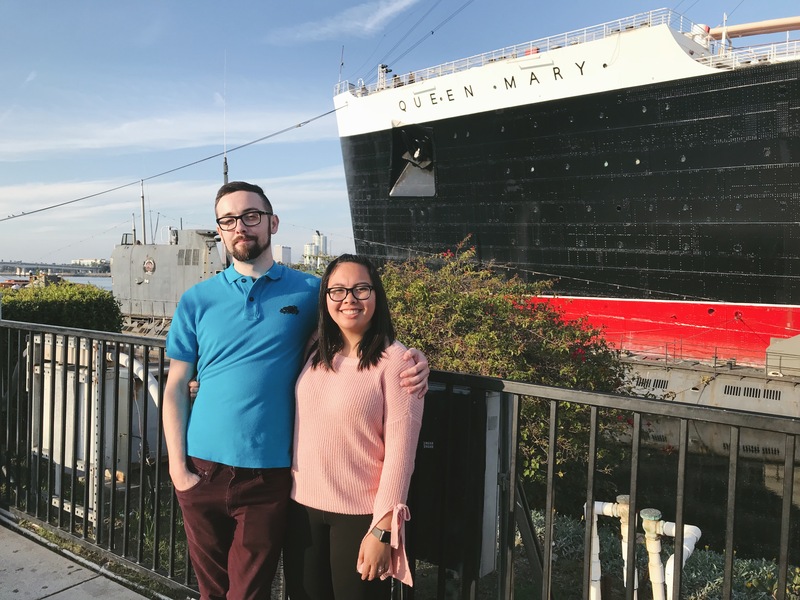 We ended up going to the Lego room where they had a giant Lego replica of the Queen Mary, and spent a good ten minutes trying to find the Lego kitty! We found it, but unfortunately there was no price. On our way home, Chris and I stopped by my old job so I could drop off a present for my best friend’s baby, and also, I wanted to say hi to my old patients (whom I miss so dearly) and coworkers. When we got home, we ate some more. We rang in the New Year with some good food, good company and spoonfuls of herring. I know it’s two months into 2018 but this post just about sums my busy December festivities. How did you celebrate your holidays? And, how is your year going so far? This looks like such a lovely ay to celebrate your mom’s birthday! I’ve spent loads of time with family and friends so far this year, plus had my prelims too so it’s been really busy! Your mom is soooOooo pretty! Good food and good company is definitely the best way to ring in the new year. Gosh, I can’t even remember what we did on New Years Eve, lol! I think we just lit up some small fireworks in the front yard and I’m pretty sure I fell asleep like around 10pm, I didn’t even make it to midnight, haha! Happy Birthday to your mom! This buffet looks amazing. The ship is so cool. Thanks for sharing! 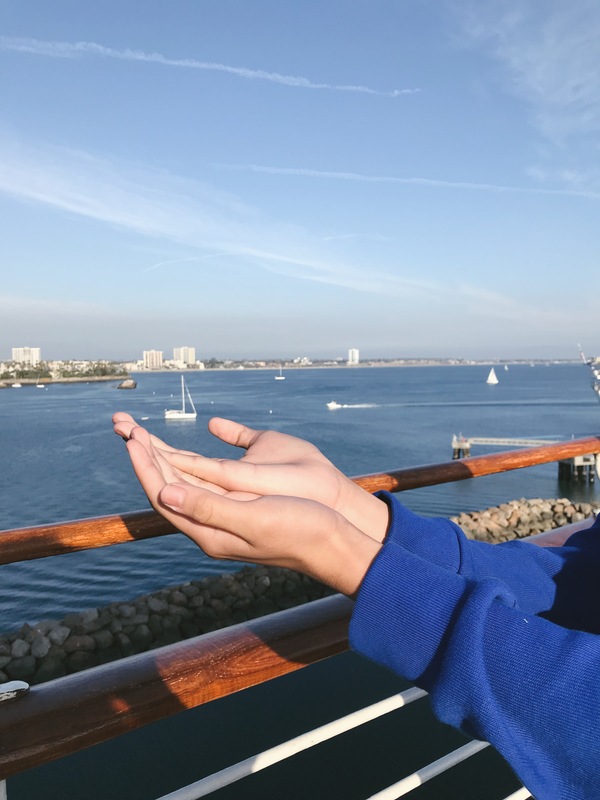 It’s so cool that you guys celebrated your mother’s birthday at the Queen Mary! I’ve never been there before but always hear about things going on there. YASSSS medium rare is the best!!!! Ok, I need to see this Lego kitty for myself! It’s so sweet of you to drop by your former patients while making a trip to your old job! HAha, sounds like you had lots of delicious food to go around!! Jeez, December felt so long ago… Hope you’re having a great year so far! Random comment, but your mum is so young! The year has been going alright thus far. January was full of highs, and Feb has a few lows. Oh well, should even out over the course of the year. 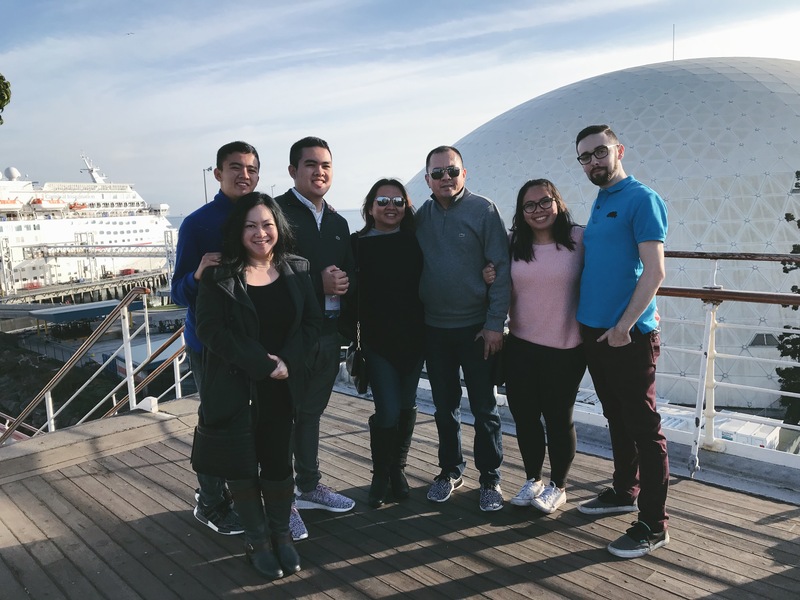 What a fun way to celebrate your mom’s birthday! I have been living in Southern California for nearly a decade and still haven’t gone to the Queen Mary. I should probably visit before I move! No way, your mom does NOT look 46! Good genes and self care! A happy belated birthday to your mama. Mmmm, prime rib, medium rare. I’m salivating just thinking about it. Brunch is the BEST! Especially when there’s a solid dessert station haha. Your momma looks so happy! The start of our year is going great, and there’s so much fun stuff to look forward to. I honestly can’t even remember what we did on New Year’s Eve haha. We were probably in bed by 12:01! Hope you guys have been having a great start to your new year! And that must have been nice to visit your old job and visit all your old patients and coworkers! When I was interning at Fred Hutch (a Cancer research center), I did these transcripts for interviews and I heard a lot of stories of the relationships between the nurse and their patients and how much those relationships mattered. Hope your February is going great! Such cute family photos! December sounded nice for you, I already miss mine too! Yes to medium rare beef! Looks like your mum had the loveliest time! It sounds like all of you had a great time. And I’m jealous. I consider myself lucky when I get Chinese take out, heh. It’s not even 9AM yet and I’m hungry for some prime rib now XD “Medium rare is the way to go, y’all.” < IT SURE IS! Happy belated bday to your mom! I can really see the similarities between you and her!